Bass Island Line will soon be introducing some improvements to the weekly BIL Update newsletter. A new and improved format along with content changes aer on their way. It’s our hope that this will improve the quality of the newsletter for our stakeholders and customers. After almost 80 editons across more than 16 months, it’s time for an upgrade, so stay tuned! 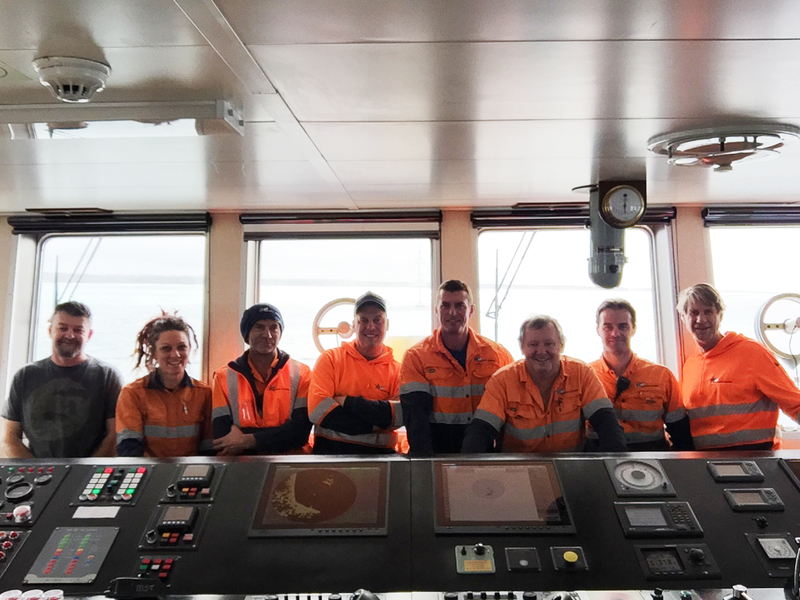 The hard working crew of John Duigan has been enjoying some calmer weather in recent weeks and recently took a moment to capture this great photo, en route from Geelong to Grassy. We thought it would be nice to introduce you to the crew, and since it’s AFL Grand Final tomorrow let you know which team they barrack for. There is a West Coast Eagles and Collingwood supporter on board so a bit of good natured rivalry is expected when the crew watch the game at the Port of Grassy! Andrew Brewster: Ships Master – Hawthorn. Kerrie Roach: Cook/Crew – No preferred team. Brendon Anthony (Benny): Crew – Hawthorn. Johan Kalter (Dutchie): Chief Engineer – No preferred team. Ian Kuhnel: Crew/relief 2nd mate – Collingwood. Mick Byrne: 2nd Mate – West Coast Eagles. Aaron Bird: 2nd Engineer – Geelong. Rod Savage: Chief Officer – Fremantle.